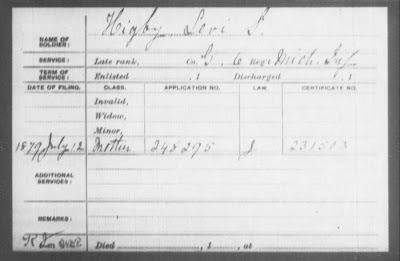 Source: Civil War Pension Index Card of Levi L. Higby. Organization Index to Pension Files of Veterans Who Served Between 1861 and 1900. National Archives and Records Administration. Publication T289. Digital image purchased at Footnote [http://www.footnote.com/]. Biography or Information of Interest: I'm not a military historian, so I can't tell for certain, but it appears that the heavy artillery regiment that Levi served with was assigned to the 6th Michigan Infantry at the time of his death. His widowed mother applied for his pension benefits in 1879. Buried: Chalmette National Cemetery, Arabi, St. Bernard Parish, Louisiana. He appears to also have a monument in the Higby family plot in Westchester Cemetery, Byron Twp., Kent Co., Michigan. 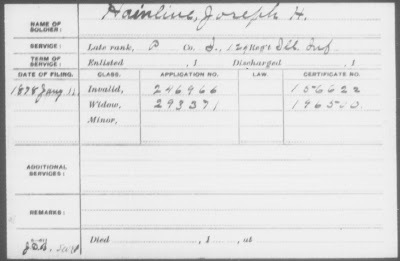 Source: Civil War Pension Index Card of Joseph H. Hainline. Organization Index to Pension Files of Veterans Who Served Between 1861 and 1900. National Archives and Records Administration. Publication T289. Digital image purchased at Footnote [http://www.footnote.com/]. Enlisted: 14 August 1862; private. Enlisted 10 September 1862 in Co. I, 124th Illinois Infantry. Biography or Information of Interest: Again, I don't have a lot of detailed information on the Hainline brothers. I know they descended from Palatine immigrants with the surname HENLEIN who arrived in Virginia in the mid-1700s. The fact that Joseph lived less than 17 years after the war ended tells me that he may have died of war-related injury or illness. Source: Headstone of Joseph Hardin Hainline, Spring Creek Cemetery, Emmet Twp., McDonough Co., Illinois. Original photograph in the possession of Carol Dowell, McDonough Co., Illinois. 2002. 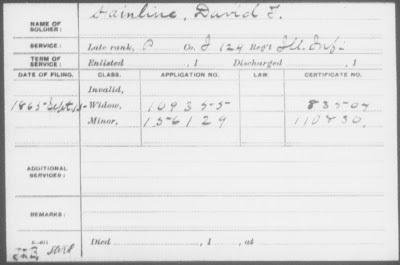 Source: Civil War Pension Index Card of David T. Hainline. Organization Index to Pension Files of Veterans Who Served Between 1861 and 1900. National Archives and Records Administration. Publication T289. Digital image purchased at Footnote [http://www.footnote.com/]. Biography or Information of Interest: David is a bit of a mystery. While he died just after the war, it is not clear from what little information I can find if he died from a war-related injury or illness, although I suspect that is the case. Since I currently don't have access to his pension records (for his wife and orphans), I don't have the necessary details. Children: James R. (1866 - 1957), William Hardin (b. c. 1868), Paulina (b. c. 1870), Charles F. (b. c. 1872), Ellsworth E. (b. c. 1874), John (dates unknown) and Sadie Marie HAINLINE (1886 - 1970). 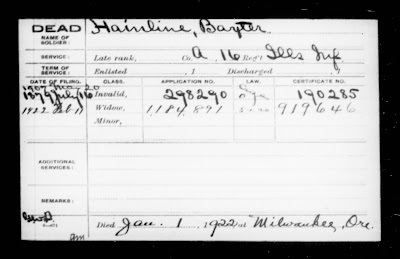 Source: Civil War Pension Index Card of Baxter Hainline. Organization Index to Pension Files of Veterans Who Served Between 1861 and 1900. National Archives and Records Administration. Publication T289. Digital image purchased at Footnote [http://www.footnote.com/]. Biography or Information of Interest: There are three other Hainlines who served in Company A of the 16th Illinois Infantry, and they probably are Baxter's cousins: James L., Nathan T. and William H. HAINLINE. While researching Baxter, I recently found some contact information for one of his descendants and am waiting to hear back. Source: Fredenburg(h), Sylvester. Photograph, reproduction. C. 1861. Original photo in the possession of Mary Jane Fredenburg Hittle, Columbiaville, Michigan. 2008. Children: With Mary Jane, he had two daughters: Maryetta (b. c. 185) and Sarah E. FREDENBURG (1868 - 1937). 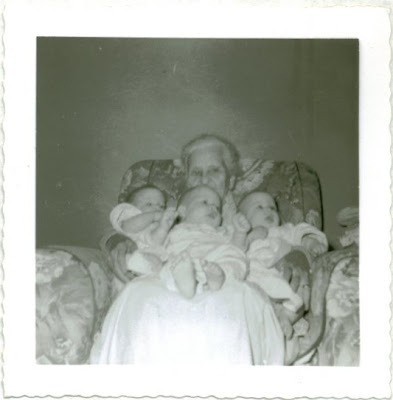 With Cornelia, he had three children: Mary Jane (1872 - 1962), my ancestor, named for his first wife; George Franklin (1873 - 1965); and William Anthony FREDENBURG (1876 - c. 1947). Source: Civil War Pension Index Cards of Sylvester Fredenburg(h). Organization Index to Pension Files of Veterans Who Served Between 1861 and 1900. National Archives and Records Administration. Publication T289. Digital images purchased at Footnote [http://www.footnote.com/]. Enlisted: 14 December 1861 at Penn Yan, Yates Co., New York; private. Enlisted 17 December 1861 in Co. A, 50th New York Engineers (same company as his brother Abram). 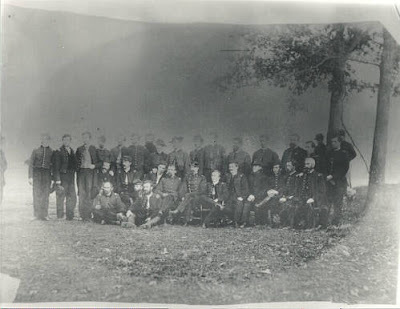 Enlisted 14 March 1862 at Milo, Yates Co., New York in Co. I, 33rd New York Infantry. Mustered out with company 2 June 1862 at Geneva, Ontario Co., New York. Returned to Co. I, 33rd New York Infantry in November 1862. Re-enlisted 16 January 1864 at Jerusalem, Potter (now Yates) Co., New York. Enlisted 23 January 1864 in Co. L, 50th New York Engineers. Biography or Information of Interest: Sylvester's discharge paper states he was five foot, six inches high, dark complected, with brown eyes and brown hair. His pension papers were full of great genealogical information, as his widow, Cornelia, applied first for a widow's pension on his account, and then later on her second husband's--a Navy veteran--account. Since both Sylvester and Washington Foster JUDD (her second husband) had been married and had children before marrying Cornelia, there were all sorts of marriage records and affidavits as to the births of the prior children. Unfortunately, Cornelia--being illiterate--had incorrect birth dates for all hers and Sylvester's children (listing all three as being born after his death!) as well as having listed an incorrect regiment for Sylvester's service. In the record of his service, it was discovered that he "deserted at Geneva, N.Y. April 1, '62. Retaken Sept. 1, '62." At his court martial, he was sentenced to a " loss of all pay up to Sept. 30, '62." His records also show he was hospitalized in August, again in September, and still again in October of 1864. Friends of the family attested that he had never been completely well after his return from the war and that he had a persistent cough. His death record states he died of spinal disease. It appears he probably had tuberculosis. Mustered in: 20 Februay 1862 at East Saginaw, Saginaw Co., Michigan in Co. E, 7th Michigan Cavalry; private. Source: Andersonville Prison, Camp Sumter, Ga., as it appeared August 1st 1864 when it contained 35,000 prisoners of war / drawn from memory by Thomas O'Dea, late private Co. E. 16th Regt. Maine Infi. Vols ; on stone by T. J. S. Landis. Lithograph. N.Y. : Henry Seibert & Bro. Art Litho., 12 & 14 Warren St., [1864 or later]. In the possession of the Library of Congress Prints and Photographs Division Washington, D.C. 20540 USA. Digital print accessed online [http://hdl.loc.gov/] on 24 April 2008. Biography or Information of Interest: It appears that Benjamin was taken prisoner on or before 11 June 1864, where he is listed as a prisoner of war at Trevillian Station, Virginia. It's hard to believe, but we're already nearing the end of the month of April, and you know what that means! That's right! Scanfest! A little about last month's Scanfest and Spring Break Scan-a-thon: We tied with February's number of ten participants on Sunday, March 30th: Jasia, footnoteMaven, Colleen, Thomas, Donna, Sheri and Bonnie (both non-bloggers), Lee, Renee, and myself. As ever, we had a lot of fun! We decided we were all tired of the snow and going to visit Colleen in Arizona, using Bonnie's RV (which we dubbed the Scanmobile) and scan people's photos to pay for our gas to get there. Thomas was immediately dubbed Chef, as he is the one out of all of us that truly loves to cook (and does it well!). Yes, we get silly, but we also get a lot scanned! And it's a great way to really get to know one another. We also had two mini-Scanfests with smaller groups on Tuesday, April 1st and Thursday, April 3rd and caught up with people here and there on Windows Live Messenger during the week. I did get all the postcards in the Westaby-Lerfald collection scanned and hope to eventually get those all posted, one by one, on this blog, as time allows. Source: Fredenburg Family Photograph. Reproduction of framed photograph. C. 1861. Original photograph believed to be in the possession of Dorothy Needham Moreno, Ann Arbor, Michigan. 2001. 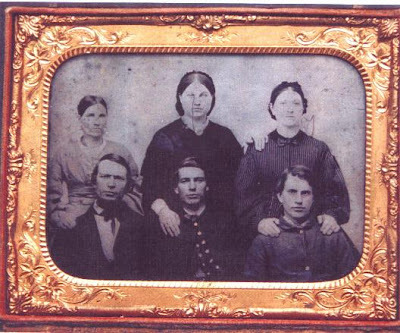 The above photograph shows the Fredenburg family. Sitting in the front row, left to right, are men who are believed to be Anthony (father), Abram, and Sylvester FREDENBURG. Standing in the back, left to right, are women believed to be their spouses: Hannah Fox (mother), Myra [--?--], and Mary Jane [--?--] FREDENBURG. 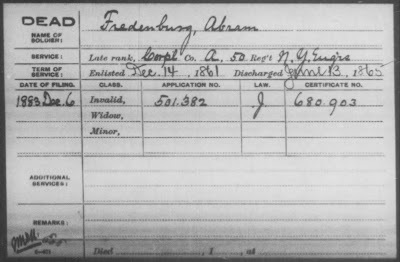 Source: Civil War Pension Index Card of Abram Fredenburg. Organization Index to Pension Files of Veterans Who Served Between 1861 and 1900. National Archives and Records Administration. Publication T289. Digital image purchased at Footnote [http://www.footnote.com/]. Enlisted: 14 December 1861 at Penn Yan, New York; private. Enlisted in Co. A., 50th New York Engineers on 17 December 1861. Biography or Information of Interest: There is some speculation that Abram also served in the 24th New York Cavalry, but I haven't investigated enough to see if the man by that name in that regiment is the same as "my" Abram. The Confederate Veteran Grave Database remains a work in progress. Currently, the database contains the collected grave information from the 17 counties in Georgia that make up the 9th Brigade of the Georgia Division of Sons of Confederate Veterans. The ultimate goal is to collect the grave information from all of Georgia’s 159 counties. I hope they plan to add Confederate veterans' graves from other states as well! Source: Dickinson, William. Photograph. Date unknown. Digital image found at Newaygans in the Civil War [http://ncha.ncats.net/data/Civil_War_Veterans/]. Whereabouts of original photo unknown. 2008. Siblings: William was the youngest of 14 children! Married: Caroline A. HART (c. 1819 - 1857) on 21 December 1844 in Cornwall, Litchfield Co., Connecticut. Also married Sarah A. BARNES (1836 - 1908) on 7 November 1857 in Johnston Twp., Trumbull Co., Ohio. 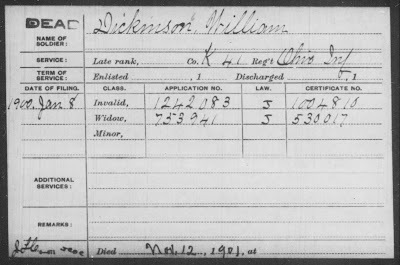 Source: Civil War Pension Index Card of William Dickinson. Organization Index to Pension Files of Veterans Who Served Between 1861 and 1900. National Archives and Records Administration. Publication T289. Digital image purchased at Footnote [http://www.footnote.com/]. Biography or Information of Interest: For further information, see Newaygo in the Civil War by John A. Braden and my cousin Terry Wantz. Use the Find feature of your browser and look for Dickinson in the text. Source: Westaby, Ann Wilson. Photograph. Date unknown (c. 1870s - 1880s?). Original photograph believed to be in the possession of David Eden, Bushnell, Illinois. 2008. This is something I want my hubby and children to get me for Mother's Day: tickets to the Mother's Day Historic House Tour. These self-guided tours benefit the Northwest Museum of Arts and Culture, and this year, residential landscapes designed by the Olmstead Brothers will be featured. Yes, those Olmstead Brothers: designers of New York's Central Park and Spokane's Manito Park, and countless other city parks and landscapes. I'm only sorry I haven't heard about this before, having lived in this county for nearly 24 years! The Alpine Township (Kent County, Michigan) Historical Museum soon will. This human-interest story in the Grand Rapids Press about a nearly-90-year-old woman who is donating her entire button collection to her local museum caught my eye. We genealogists collect some unusual items, to be sure, marveling and wondering at the history behind them. If these buttons could talk, I'm sure they'd entertain us for years with their stories! Source: Dickinson, Wallace William. Photograph. C. 1863. Digital image found at Newaygans in the Civil War [http://ncha.ncats.net/data/Civil_War_Veterans/]. Whereabouts of original photo unknown. 2008. Source: Sergeants of the 3rd Michigan Infantry. Photograph. 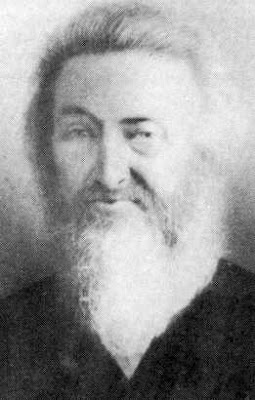 C. 1861. Original photograph in the possession of Archives of Michigan Digital Collection [http://haldigitalcollections.cdmhost.com/]. 2008. Sgt. Dickinson is believed to be the man squatting on the left. Enlisted in: 13 May 1861 in Co. K, 3rd Michigan Infantry at Grand Rapids, Kent Co., Michigan; sergeant. 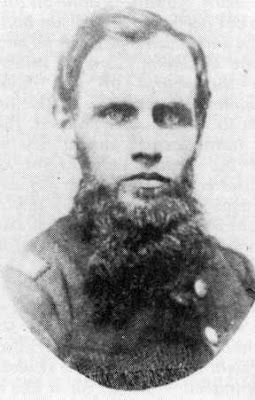 Enlisted 25 July 1863 in Co. A, 10th Michigan Cavalry at Newaygo, Newaygo Co., Michigan; 2nd lieutenant. Enlisted 18 October 1863 in Co. A, 10th Michigan Cavalry at Newaygo, Newaygo Co., Michigan; 1st lieutenant. Source: Officers of the 10th Michigan Cavalry. Photograph. C. 1863. Original photograph in the possession of Archives of Michigan Digital Collection [http://haldigitalcollections.cdmhost.com/]. 2008. Lt. Dickinson is in the middle of the three men sitting on the ground. Biography or Information of Interest: (from his obituary) "Lt. Wallace W. Dickinson, a former resident of this county, and for 4 years county treasurer, died at his home in Grand Rapids on Thursday morning, June 10. Nearly the last request made by Mr. Dickinson was that his remains should be laid in the Newaygo Cemetery and the brethren of Newaygo Masonic Lodge of which he had long been a member should have charge of the services. 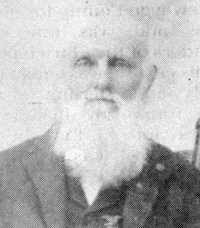 When Mr. Dickinson was in Newaygo last fall attending the reunion, his friends felt that he had not long to stay and his old comrade, Lucius Gates, requested of Mrs. Dickinson to let him know of the death in order that the G.A.R. might attend his funeral in a body. Mr. Dickinson also requested that notice of his death be sent to John H. Simmons of this village who was county clerk at the time. Mr. Dickinson was county treasurer, a brother Mason and a life long friend Mr. Simmons, was notified of the requests and under his direction arrangements were made for the funeral and the family of the deceased are profoundly grateful to him and the citizens of Newaygo, the Masons and the G.A.R. for the tributes of respect and esteem paid his remains by his old friends, his brethren and comrades. 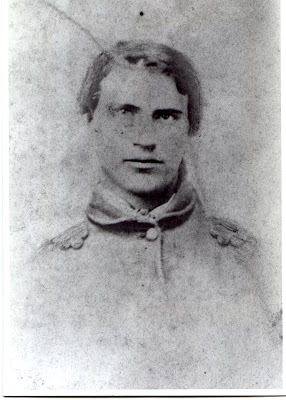 "Lt. Dickinson was born in Trumbull County, Ohio in 1831. A portion of his childhood days were spent in Indiana. He was educated in Hiram, Ohio and was a classmate of James A. Garfield. He came to this county in 1855 and settled near Croton. He was a pronounced anti-slavery man and at the first call to arms after the breaking out of the rebellion he enlisted in the Third Michigan Infantry, being, if we are correctly informed, the first man in the county to enter the service. After the expiration of his term of service he returned to Newaygo County and engaged actively in recruiting for the 10th Michigan Cavalry, being afterwards appointed to a Lieutenancy in the regiment. Judge Woodward, Lucius Gates and others who still reside here were members of this company. At the close of the war, he again returned to Newaygo and in 1868 was elected county treasurer which office he held for 4 years. At the expiration of his term of office, he engaged in lumbering and removed to Ludington to be nearer the scene of operations. After closing out his lumbering interests he removed to Grand Rapids which was his home until his death. About 1870 he was married to Miss Elizabeth Garrison of Eastmanville who survives him. Two children, a son and daughter came to them, the son is still living, the daughter having passed over a few years ago. "For nearly 29 years, the writer enjoyed the friendship of Wallace W. Dickinson and his pure-hearted, unselfish and noble character impressed itself upon him at the beginning of that acquaintance. Guileless himself, he believed all men the same and on that account, he was sometimes imposed upon, but a man never lived that knew of a wrong thing intentionally done by him. Single-hearted and true to those he believed to be his friends, loyal to his country and his family, he leaves behind him that of which any man might be proud, the record of a pure and blameless life." For further information, see Newaygo in the Civil War by John A. Braden and my cousin Terry Wantz. Use the Find feature of your browser and look for Dickinson in the text. More on the Dickinson brothers can be found in the Portrait and Biographical Album of Newaygo Co., Michigan. Chicago, Illinois: Chapman Brothers, 1884. Source: Dickinson, Philip Reuben. Photograph. Early twentieth century. Digital image found at Newaygans in the Civil War [http://ncha.ncats.net/data/Civil_War_Veterans/]. Whereabouts of original photo unknown. 2008. Siblings: Philip had 11 siblings! Children: Harriet Alice (1857 - 1934), Ada May (1859 - 1881), Arsa Ezra (1862 - 1862), Cynthia (b. c. 1863), Mary (b. c. 1866), Willard Walter (b. 1868), Philip Grant (b. 1872), and Clara Bell DICKINSON (b. 1879). Two more unknown. 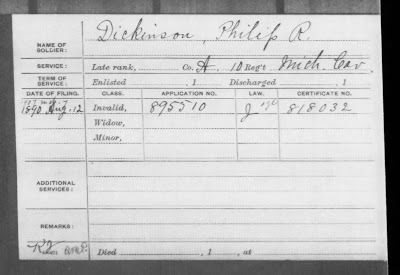 Source: Civil War Pension Index Card of Philip R. Dickinson. Organization Index to Pension Files of Veterans Who Served Between 1861 and 1900. National Archives and Records Administration. Publication T289. Digital image purchased at Footnote [http://www.footnote.com/]. Enlisted: as a Corporal on 13 July 1863 at Fremont, Newaygo Co., Michigan. Enlisted in Company A, 10th Michigan Cavalry on 2 September 1863. Promoted to Full Sergeant. More on the Dickinson brothers can be found in the Portrait and Biographical Album of Newaygo Co., Michigan. Chicago, Illinois: Chapman Brothers, 1884. Here's a story from the Grand Rapids [Michigan] Press that's both a heartwarmer and a tearjerker. In 1932, a destitute father dropped off six of his children at St. John's Home, an orphanage in Grandville, Kent County, Michigan. On Saturday, the last of the children reunited. Some of the siblings have passed away, but their families have met the other siblings. The reunion "was the last in a series of reunions brought about by a handful of dim childhood memories, a few deathbed revelations and, ultimately, a series of Internet searches." Siblings: Are you ready for this? Ezra was one of 14 children! Married: Ezra married five times! His first wife was my ancestor. Children: Of course, since Ezra had lots of siblings and lots of wives, it would only stand to reason that he would have lots of children! Amazingly enough, all his children were from his first wife, Cynthia, which might explain why she died young. 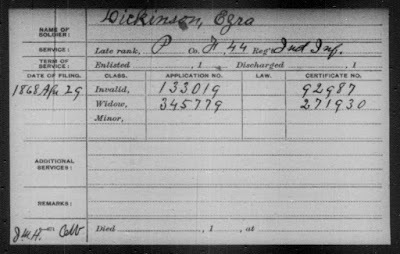 Source: Civil War Pension Index Cards of Ezra Dickinson. Organization Index to Pension Files of Veterans Who Served Between 1861 and 1900. National Archives and Records Administration. Publication T289. Digital image purchased at Footnote [http://www.footnote.com/]. Mustered in: 22 Nov 1861 in Company F, 44th Indiana Infantry, probably in Butler, De Kalb Co., Indiana; private; age 63! Biography or Information of Interest: Born into a family that had settled in America during Puritan times, Ezra was distantly related to Emily Dickinson, the poet. His grandfather, Elisha Dickinson, served in the Continental Army during the Revolution. Like many Connecticut families, they migrated to the Western Reserve in Northeastern Ohio, settling first in Trumbull County. After living in Indiana for some time, Ezra moved his family to a farm near Hicksville, Defiance Co., Ohio to be near a school for the deaf, since three of his children were deaf-mutes. All three--John, Sherman, and Harriet--grew up to marry and have children, unusual for that time. Ezra's family later returned to De Kalb Co., Indiana, where he signed up to serve in the Union Army at the age of 63, stating that he was 45. His brother William, and his sons Philip and Wallace also served in the Union Army. You can read Ezra's biography from the History of De Kalb County, Indiana here (some dates in the biography do not match our records). 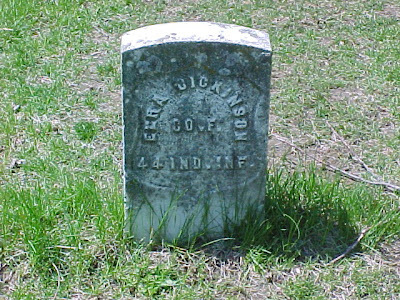 Source: Tombstone of Ezra Dickinson, Evergreen (Auburn) Cemetery, Union Township, Indiana. Photograph taken at the request of Miriam Robbins Midkiff by Find A Grave volunteer Donald Ladd. Digital copy in the possession of Miriam Robbins Midkiff, Spokane, Washington. 2008. Here's a story from the Muskegon Chronicle that interests me both from a genealogical and personal standpoint. Muskegon is one of my ancestral locations, and as many of you know, my parents served in The Salvation Army in Alaska for a number of years during my childhood. For those of you who are unaware, The Salvation Army is first a church, and then a social service agency. There's a little history about both The Salvation Army as a church and its history in the community of Muskegon. That early Salvationists were thrown into jail for disturbing the peace during their first visit to Muskegon is not unusual for the early history of this church. I wonder what my LEWIS, WILKINSON, SAYERS, and ROBBINS ancestors thought when they read about this in their local newspaper (probably the Chronicle!) in 1885. None of them were Salvationists. I'd give anything to be able to go back and time and hear their responses to this event! 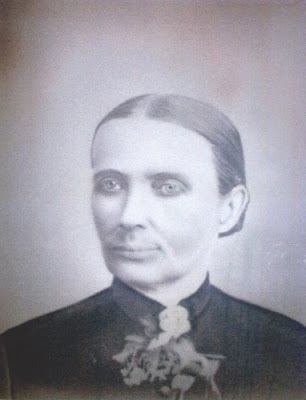 How Related: Brother of my husband's 2nd-great-grandmother, Mariah Emily DAILEY. Siblings: Anna Margaret (1827 - 1917), Charles (b. 1829), Elizabeth (1834 - 1906), Catherine (b. 1836), Susan (b. c. 1838), Nancy (b. c. 1840), Louisa Jane (b. c. 1842), Samuel N. (b. 1844), and Marah Emily DAILEY (1849 - 1935). There also appear to be at least two females born between 1824 and 1828 who died in infancy. Children: Andrew Isaiah (1861 - 1926), Margaret Jane (b. c. 1866), William Addison (b. c. 1867), Joseph Ephram (b. c. 1869), Huldah Jane (b. c. 1872), Peter (b. c. 1873), David Jasper (b. 1875), Rebecca Jane (b. c. 1878), Hester Ellen (b. 1885) and Ted DAILEY (b. 1888). Source: Civil War Pension Index Cards of William J. Dailey. Organization Index to Pension Files of Veterans Who Served Between 1861 and 1900. National Archives and Records Administration. Publication T289. Digital image purchased at Footnote [http://www.footnote.com/]. 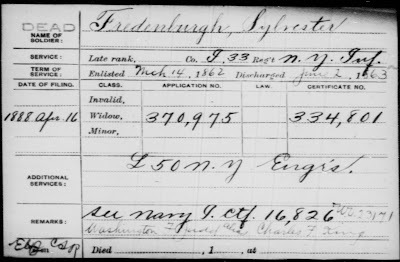 Enlisted: 10 October 1861, probaby at Sidney, Fremont Co., Iowa. Enlisted in Co. F, 15th Regiment Infantry, private on 18 November 1861. Biography or Information of Interest: William lived all over the Midwest, moving often during his lifetime until he settled down in Custer County, Oklahoma by 1910. Born in Indiana, he lived in Iowa, married in Missouri (where his wife was born), and lived in Kansas and Oklahoma. In each of these states, he can be found in different communities over time. While I don't know much about William or the reasons for his migrations, I do know that his sister Mariah, my husband's ancestor, also ended up in Oklahoma, as did their brother Samuel. It seems this family was typical of many American families in that they migrated to new locations together. Unlike the two previous Civil War soldiers I've featured, William lived a long life and appears to have been disability-free. He received a pension from the federal government for his service, which his wife continued to get after his death until her own. 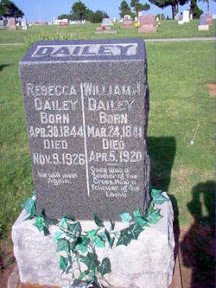 Source: Tombstone of William J. and Rebecca Dailey. Greenwood Cemetery, Weatherford, Custer Co., Oklahoma. Photographed by Anna Hayes, photo volunteer for Find A Grave [http://www.findagrave.com/]. 2007. 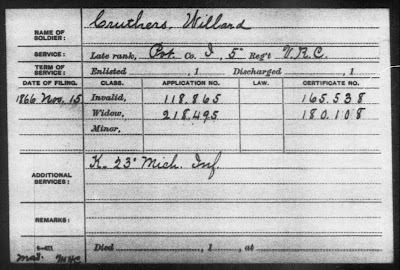 Source: Civil War Pension Index Cards of Willard Cruthers. Organization Index to Pension Files of Veterans Who Served Between 1861 and 1900. National Archives and Records Administration. Publication T289. Digital images purchased at Footnote [http://www.footnote.com/]. Enlisted: 11 August 1862 in Co. K, 23rd Michigan Infantry in Atlas Twp., Genesee Co., Michigan; private. On 15 February 1864, he was transferred out of Co. K, 23rd Michigan Infantry and into the U.S. Veteran Reserve Corps, 152nd Co., 1st Battalion (Invalid Corps), a.k.a Co. I, 5th Regiment, Veteran Reserve Corps. 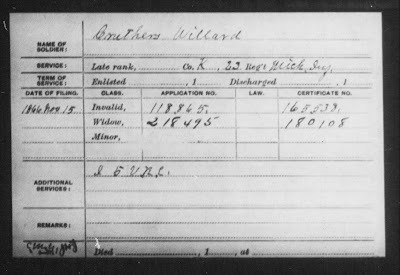 Biography or Information of Interest: While serving in Company K of the 23rd Michigan Infantry, Willard was put on picket duty on 18 October 1862 near Frankfort, Kentucky when he came down with the measles. Apparently, there was also a heavy snow storm (in October? in Kentucky?) and he became very ill due to the measles and exposure. In the morning, he was unconscious and so was taken to a log house in which about 20 other men were also ill and being cared for by an old black woman. As soon as they were able, they were all moved on to join their regiment. Willard, however, immediately contracted tuberculosis and spent the remainder of his military service in one military hospital after another. Finally, he was transferred to the Invalid Corps and later discharged at St. Mary's Hospital in Detroit. He suffered from this wasting disease for over five more years before his death. The 46th Edition of the Carnival of Genealogy is Posted! Jasia has just posted the 46th Edition of the Carnival of Genealogy at her blog, Creative Gene. Twenty-eight bloggers (including two COG newbies) submitted 29 posts on the topic "What Traits Run in Your Family?" My own submission is "Head, Shoulders, Knees and Toes..."
It's time for a geography lesson. Pick out a city/town/village where one of your ancestors once lived and tell us all about it. When was it founded? What is it known for? Has is prospered or declined over the years? Have you ever visited it or lived there? To a certain extent, we are all influenced by the environment we live in. How was your ancestor influenced by the area where they lived? Take us on a trip to the place your ancestor called home. The deadline for submissions is May 1, 2008. You can submit your post here. Meanwhile, take a gander on over to Jasia's blog and enjoy reading the interesting and humorous submissions! Source: Strong, Edwin Floyd. Photograph. C. 1916. Original photograph in the possession of Avis Strong Russell, Italy, Texas. 2008. This handsome young man is Edwin Floyd STRONG, the youngest son of my maternal great-great-grandparents, Charles Frisbe STRONG and Mary Lucy WRIGHT. He was the eighth of their ten children, and just older than my great-grandmother, Lillian Fern STRONG. 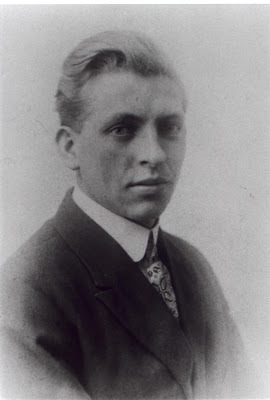 Edwin was born 9 February 1893 in Grand Rapids, Kent Co., Michigan and with his parents and many siblings spent much of his childhood moving back and forth between Western Michigan and Tioga County, New York, his parents' birthplace. His father seemed to have an itchy foot, and whether he couldn't keep a job or simply didn't like living in one place too long, the family was constantly on the move. My great-grandmother wrote that she attended 15 different schools in her lifetime, and it's likely that Edwin, just four years older, attended as many or more. The family eventually migrated west, with their mother and sisters cooking for threshers. They spent one very cold winter in Saskatchewan, Canada--probably in Fiske, where older brother Archie was living--residing in a sod home. It was so cold that a little pet calf they had froze its ears. At last they arrived in Seaside, Clapsop Co., Oregon. 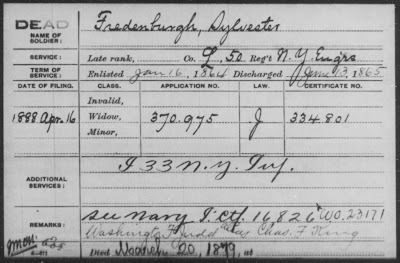 Edwin was working as a laborer for a door and sash company when the 1910 federal census was taken. 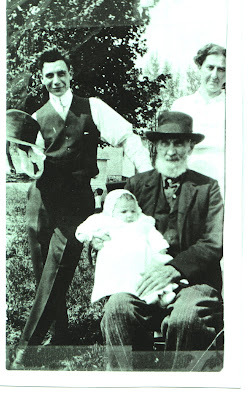 Part of the family returned to Grand Rapids and it was there that Edwin married Margaret Viola McELHENY on 10 September 1916, just ten days before my great-grandmother Lillian married my great-grandfather John Martin HOEKSTRA. The two young couples were very close and spent much time together. 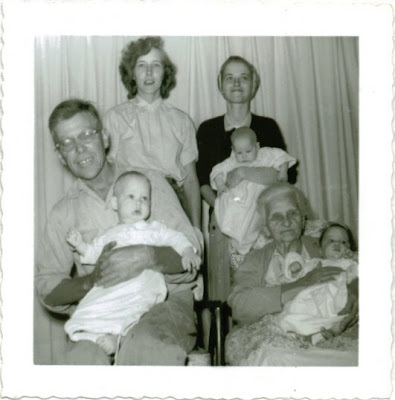 My great-grandparents had three little girls, and Ed and Vie had four all around the same age as their cousins. It must have been quite a ruckus for those seven girls to get together and play! I believe Ed and Vi spent the rest of their lives in Grand Rapids as my great-grandparents did (the Strong siblings were probably glad to be settled in one community for a good long time!). Edwin died two days before his 90th birthday on 7 February 1983 in Grand Rapids and is buried in Graceland Memorial Park in that city. Nothing to do with genealogy, but this is a great memory my siblings and I share: my dad reading to us from The Family Book of Best Loved Poems, edited by David L. George. Published in New York City by Doubleday & Company in 1952. This book was originally owned by my Hoekstra great-grandparents, and it made its way to our home in Alaska after they passed away. Our favorite poem was The Duel by Eugene Field, and I know we all had it memorized! The gingham dog went "bow-wow-ow!" And wailed, "Oh dear! what shall we do?" That burglars sole that pair away! Source: Crapsey, Angelo. Photograph. C. 1863. Digital copy from the Faces of the Pennsylvania Reserves website [http://www.pareserves.com/PRVCGALLERY/details.php?image_id=559]. Original photograph's whereabouts unknown. 2008. Enlisted: 30 May 1861 at Port Allegany, McKean Co., Pennsylvania in Company I, 42nd Pennsylvania Infantry (a.k.a "The Bucktails"); private. Promoted to full corporal. Promoted to full sergeant. 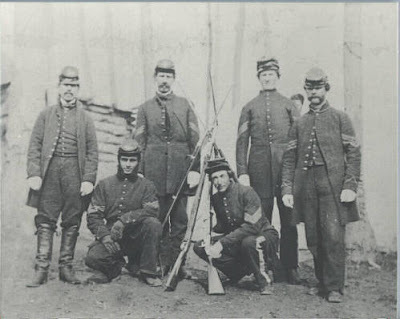 History of Unit: See the history of the 42nd Pennsylvania Infantry (also known as the 13th Pennsylvania Reserves), including battles and rosters, here and here. Source: Libby Prison, 1865. Photograph number B-119. Matthew B. Brady Collection of Civil War Photographs. National Archives and Records Administration. Publication T252. Viewed at and downloaded from Footnote [http://www.footnote.com/] 16 Apr 2008. Biography or Information of Interest: Angelo's widowed father married my widowed 3rd-great-grandmother, and thus he was raised with my 2nd-great-grandmother as step-siblings. When the Civil War began, Angelo enlisted, followed not long after by his best friend, my 2nd-great-grandfather Charles Robbins, who after the war, would marry Angelo's step-sister. 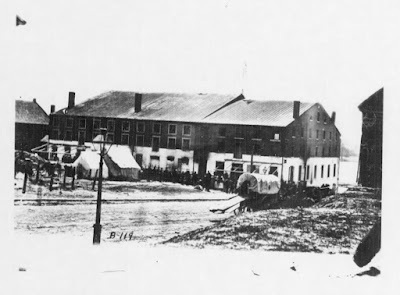 During the Battle of Fredericksburg, Angelo was captured by the Confederates and imprisoned in the infamous Libby Prison on Richmond, Virginia. The deplorable conditions combined with shell-shock caused Angelo to lose his mind. When he returned to his community and family in Port Allegany, McKean County and Roulette, Potter County, he was suicidal and had to be watched continuously. Tragically, his attempts eventually were successful when he managed to get a hold of a gun. His father later applied for his veteran's pension. The pension application is full of details pertinent to my families, as his father, step-mother, step-sister and several Robbins family members gave their testimonies to his war experiences. 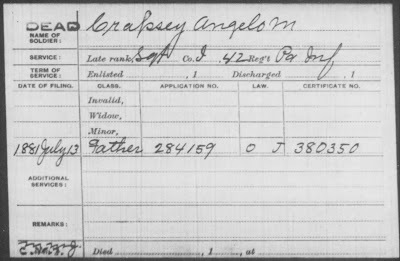 Source: Civil War Pension Index Card of Angelo M. Crapsey. Organization Index to Pension Files of Veterans Who Served Between 1861 and 1900. National Archives and Records Administration. Publication T289. Digital image purchased at Footnote [http://www.footnote.com/]. Angelo's is one of many, many tragic stories of the Civil War, and a reminder that not all men who die as a result of war die in battle. The complete fascinating story waits to be told in the as-yet-unpublished historical novel by Dennis W. Brandt. and The Valk Red Hair. I didn't get any of these traits. I did get the Robbins Teeth and Knees (neither trait is great!) and Ears (I do like them!). I also have the Valk freckles, but not as prolifically as my mother. At 5' 1/4", I'm a shorty, like my mother and her mother before her. I have blue eyes, like countless ancestors before me. I am very thrifty with my money. While I do have some Scots in me, I have a lot more Dutch. The Dutch can make the Scots look wasteful and extravagant! One of my mother's family lines is Tuinstra, which translated from Frisian means roughly "Gardener." I did not inherit any green thumbs from that line! I love history and telling good family stories, like all the Robbinses do. Sometimes that means leaving the facts out here and there. Often we add interesting details! I would say that on my husband's side of the family, the main trait they talk about is The Midkiff Humor. Watch out! It's pretty ironic! Although I'm only a Midkiff by marriage, that's an aspect where I fit right in. My kids inherited that "gene" very quickly. When my daughter was only three years old, she played a practical joke on me. A friend had come over to visit me while I was changing my infant son's clothes. After re-dressing him, I started replacing his socks and shoes. Because I was busy visiting (i.e. yakking) with my friend, I subconsciously searched around the couch for my son's shoe that seemed to have gone missing. I did not realize my daughter was watching me intently until she suddenly burst into gales of laughter and pulled the missing shoe out from underneath her! I hadn't even realized it had disappeared until that moment! Another thing I've noticed about the Midkiff men is that they walk as though they just got off their horses, although my husband's ancestors have not been on a ranch in several generations. Perhaps that's a trait they've picked up from their Civil War ancestor who served in the Texas Cavalry. 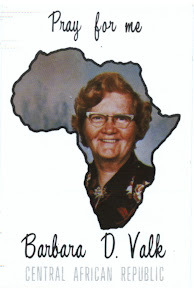 Many of my readers know that my finest moment in researching my family tree occurred in 1997 when my paternal grandmother reunited with her mother's family 70 years after she and her younger brother were kidnapped from their mother's home by their father and placed in an orphanage. 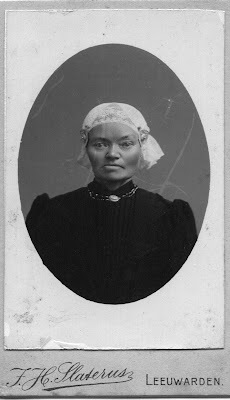 It was a great sense of restoration when we saw family photos and heard stories of similar traits that Grandma and we descendants had inherited from her ancestors. Grandma and her mother looked enough alike to be twins. They both love(d) crocheting and knitting. They are/were independent, strong-minded, stubborn women who speak/spoke their minds. Ernest is the young man on the left. I have a photo of my Grandma's Uncle Ernest, who has the same crinkly-eyed, wide-mouthed grin that my dad and his youngest sister--and I--have. My Grandmother's father had brown eyes, just like my dad's oldest sister's kids. I believe all of my Grandma's other biological grandchildren have blue eyes. I knew that my father's ancestors had been carpenters for generations in several of his father's ancestral lines. Dad was the last of his line to build a house, by hand (no power tools). However, my brother works with wood, too: he carves fabulous chainsaw carvings and competes annually. Several years ago, I discovered that my mother's Hoekstra line had several carpenters as well. Every school day, I go into the woodshop and assist half a dozen of our special needs students as they cut, drill, sand, and glue pieces of wood into birdhouses, banks, shelves, and racecars. I love the smell of wood being cut and I love working with it, shaping it from generic planks into three-dimensional works of art. Speaking of creativity, writing is in the blood of the ladies of my direct maternal line. My great-grandmother was an invalid for many years before her death. She wrote letters and filled out a Family History book to pass the time. My grandmother probably wrote a letter nearly every day of her adult life, even after she became blind with macular degeneration. My mother wrote her parents nearly every week for years from our homes in Alaska and Washington State to their home in Michigan. And I...well I can't NOT write, which is why I love to blog. I can ALMOST get the words out as fast as I'm thinking them! If I get an opportunity later this week, I hope to post in detail about my memories of my first personal computer, Internet and e-mail experiences, and my loves and dislikes of the technology age. What memories of your first computer and technology experiences will you leave for you descendants? GenLady has posted her latest "Where Were You?" Carnival, the topic of which is the Civil War. You can see it here and here. My submission was "Civil War Soldiers and Sailors: A New AnceStories Series." The topic for the next "Where Were You" Carnival will be "Where Were You When Pearl Harbor Was Attacked?" and you can submit it here. I'm waiting to hear back from GenLady when the submissions are due and will update this post accordingly. Four and five years ago, when I was researching my Dutch and Frisian ancestry and creating family history pages on these lines for my personal genealogy website, I came across a website that was invaluable: the "unofficial" Holland-America Line website, originally located at http://www.unofficial.net/hal/. The term "unofficial" was used, because the Holland-America Line is still very much a viable passenger ship company with its official website located here. This comprehensive site was vital for researching the ships on which my Dutch and Frisian ancestors immigrated. Filled with photographs and paintings of the many ships of the H-A Line, along with the history of each ship and occasional information on the captains and crews, it gave me background for the history of each of my immigrant families. You can see how I used this information on my TUINSTRA and DeVRIES pages (caution: I have not yet updated the links on the pages). Then several years ago, Hans Segboer the webmaster, closed the site due to not being able to maintain it. It was a great loss to the Dutch-American genealogical and historical community. I am happy to report that last week I discovered that it has reopened at the URL http://www.halpostcards.com/unofficial/. I'm very excited to see that the site is back up. Since it went down, I discovered more names of ships on which my immigrant ancestors sailed. I look forward to using "Unofficial HAL" to do expand my research on these Dutch families! If you had ancestors who immigrated from the Netherlands, or from other European countries via a Netherlands port such as Rotterdam, be sure to check out this fascinating and informative website! Last summer, my husband was working out on our front porch doing some priming and painting, when he noticed a vehicle driving slowly down the street. He mentioned it to me later, saying that there was a camera mounted to the roof of the vehicle and it appeared to be taking pictures of all the homes on the block. "Perhaps it's the county assessor's office," I replied, knowing that all property is photographed and available for view on our county's website. Monday, I read through our local paper's news feed that Spokane had been added to Google Maps' Street View, even before (gasp!) Seattle or Portland have. And I have been having fun ever since! In fact, at work I've been having my students find their homes, friends' homes, and schools during their technology class this week. I've been able to show my own children the places I lived during my college years without using any gasoline. Yesterday, my husband and I had fun "driving" around Vancouver, Washington while he showed me his old haunts. I'm looking forward to when Grand Rapids and Muskegon, Michigan are offered in Street View so I can check out my ancestral locations. Until then, I'll play with Google Earth, Windows Live Local, and with Google Maps in the cities that do offer Street View. Source: Chaplin, Emma Alice Lyton with great-grandchildren. Photograph. C. late 1957 - early 1958. Original photograph in the possession of Alice Chaplin Midkiff. Vancouver, Washington. 2008. Source: Four-generations of the Lyton-Chaplin Family. Photograph. C. late 1957 - early 1958. Original photograph in the possession of Alice Chaplin Midkiff. Vancouver, Washington. 2008. In the front row, left to right are my children's father's maternal grandfather, Forrest L. "Frank" CHAPLIN and his mother, Emma. I believe my children's father is sitting in his grandfather's lap. In the back row are my children's paternal grandmother and her sister. Emma Alice LYTON was born 31 March 1874 in Thurmon, Fremont Co., Iowa to Mariah Emily (DAILEY) LYTON. Her father, Henry LYTON, had died the month previously. Henry was actually George TURK, born in Ottawa, Ontario, Canada, who had come to the United States and joined the Union Army, changing his name along the way for some reason (a not-so-unusual occurrence among Civil War soldiers, I've discovered). 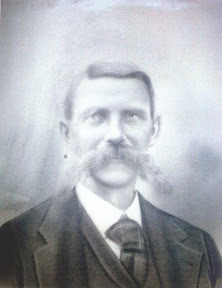 He and Mariah had three children: Charles Sanford (1870 - 1871), Agnes (1872 - 1898), and Emma Alice LYTON. When Emma was an infant, her mother married a German immigrant, John Christopher KLINDER. They had six more children: "Nancy" Florence (1876 - 1935), Laura Luella (1879 - 1962), Clara Amy (1881 - 1970), Ada (1884 - 1917), Samuel Ivory Lewis (1886 - 1970), and Susie KLINDER (1889 - 1977). Additionally, the family were found in Lamar, Prowers Co., Colorado when the 1910 U.S. Federal Census was taken and enumerated in Jaqua Twp., Cheyenne Co., Kansas in 1920. It's likely they were in Kansas so that Albert could care for his widowed mother and four older single brothers, all of whom died of strokes within the next decade. The family also lived for a time in Oklahoma, probably in Hydro, Caddo County, where Emma's mother, step-father, and half-siblings had moved in 1886. Emma and Albert's youngest child, Velma, wrote "A History of the Chaplin Family," and she recounts that the family made all their moves by covered wagon, even into the twentieth century. She wrote that these moves were great adventures for the children, but it must have been difficult for Emma to be raising a family and continuously following her husband back and forth across the Rockies and Great Plains. In 1930, with the children all grown, the couple was living in South Fruitland, Payette Co., Idaho, and five years later in the community of Payette, same county. By 1946, they had settled in the Yakima Valley of Washington State, and there Albert died in the City of Yakima. Emma moved to Portland, Multnomah Co., Oregan, probably to be near her daughter Nellie and son-in-law, George RICE. The above photographs were likely taken at her home at 6224 Southeast 111th Avenue in Portland. She passed away in that city nearly two years later on 22 Jul 1959 and was buried next to her husband at Terrace Heights Memorial Park, Yakima, Yakima Co., Washington. 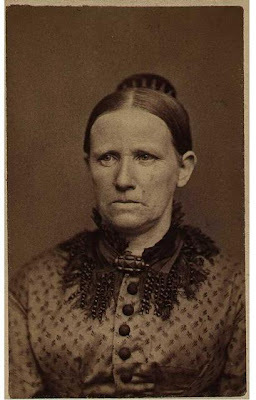 From her birth to a Civil War veteran, to traveling the West by covered wagon, to the advent of the space age, her life spanned a time of great change in America. Genealogy Happy Dance - Again!